It seems like if you're willing to strap a computer to your face, you should at least be able to listen to music with it. 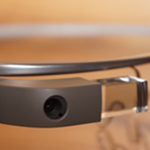 However, that isn't an option with Google Glass, but it will be in just a few short weeks. Google has announced that Glass Explorers will soon have the option to stream tunes from Google Play Music on Glass. There will also be new Glass stereo earbuds available for a proper listening experience. Like most things on Glass, music will be accessible with a voice command. Glass will be able to pull tunes from a user's uploaded library, as well as anything available with an All Access subscription. The updated Glass model just announced recently added a mono earbud, but Google is going to offer a special pair of stereo earbuds (with interchangeable color caps) for Glass that will be preferable when listening to music. It's not clear if Glass Explorers will get the earbuds for free, or if there will be a cost. For the $1500 entry fee, they ought to just hand them out. Google didn't have exact details on when this is going to roll out, but said Explorers should watch for an email in the coming weeks. The last Glass update to XE11 contained a music player APK, so hopefully there is just a switch waiting to be thrown in Mountain View.